Have you ever struggled to pin down an ancestor's movements? Do you ever wonder, "when did he go from here to there?" Surely I'm not the only genealogist who wishes he could go back in time with an ankle bracelet. This is the case for my fifth great-grandfather Thomas Kirk. At some point shortly after the turn of the 19th century, he moved from his purported birth state of Virginia to Ohio where he raised his family, died, and was buried. 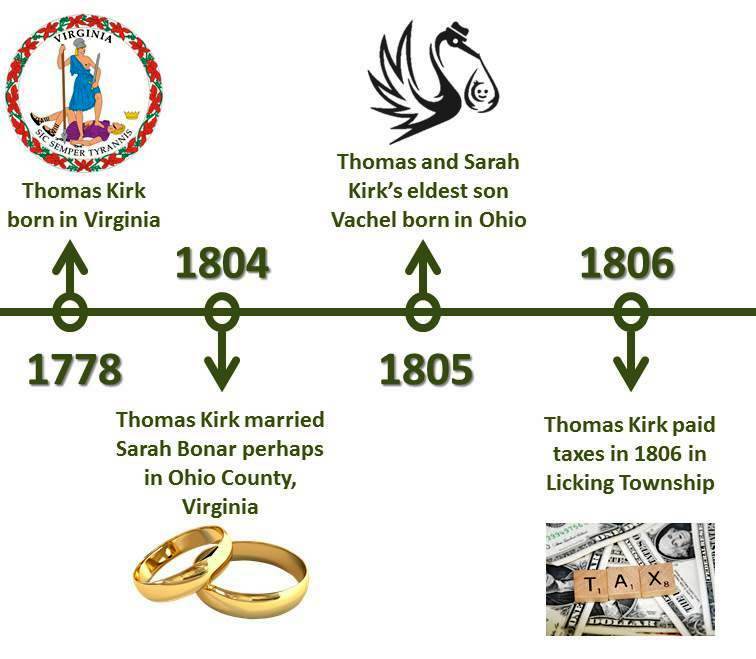 The location and date of Thomas' marriage to Sarah Bonar are unknown, but it's believed to have occurred in approximately 1804 in Ohio County, Virginia where she was born (now West Virginia). "Sarah Bonar, m ______ Kirk. The records of the late Tabitha Bonar Wilson say that Sarah "Sallie" married a man by the name of Kirk, and that they lived at Captina, Belmont Co, Ohio." The Bonar family didn't even remember the first name of the man she married! Clearly, the Kirk family was the Bermuda Triangle of documented family history. Sarah married Thomas, moved to Ohio, and slipped away. However, not without that gleaming geographic clue: according to the Bonar genealogy they initially settled in Captina, Belmont County, Ohio. I have no idea where the town of Captina is today, but Belmont County is just across the Ohio River from Ohio County, Virginia. Frustratingly, census enumerations provide limited help in this case. Census records do not exist for Ohio before 1820, and the situation in Virginia isn't much better. Virginia's 1790 census is missing and the 1800 enumeration survives for only two counties, and neither is Ohio County - where I might expect to find the Bonars and perhaps a courting Thomas Kirk. Censuses do provide an interesting indirect clue. Thomas and Sarah's eldest child, Vachel Kirk, was born in Ohio according to the 1880, 1900, and 1910 enumerated responses of his three children, positioning Thomas' family in the Buckeye state by the time Vachel was born in approximately 1805. When I read that Thomas and Sarah began married life in Belmont County, I was reminded of another connection to that area. I've been eyeing a couple - Hugh and Ann Ford - who were Thomas' neighbors in the final years of his life in Licking County, Ohio. Ann's maiden name was Kirk and she was one year older than Thomas. According to a biography of their son Hugh Jr., Hugh and Anna (Kirk) Ford lived in Kirkwood Township, Belmont County, Ohio in 1815 and "remained until April 1832" when they moved to Monroe Township in Licking County. Thomas bought 171 acres in Monroe Township beginning in 1838. Was it to be nearer his sister and brother-in-law? Before that move, Thomas lived on land that he purchased in 1812 in Licking Township. Curiously, he appeared on tax records before that year. In fact, he paid taxes on land in Licking Township as early as 1806, suggesting that he was in the area as early as 1805. If he was paying tax on land in 1806, does that mean he owned land at that time? Would a resident have paid tax on land they were just renting? This may suggest that there's a pre-1812 land record I need to track down, perhaps in Fairfield County (Before Licking County was established in 1808, Licking Township fell within the boundaries of Fairfield County). The likelihood that Thomas was in Licking Township by 1805 reminded me of yet another person of interest. A published history of Licking County included a handful of biographies of prominent citizens. One of those was for Isaiah Geiger who was the grandson of Anthony and Mary Geiger. Mary's maiden name was Kirk and she was about six years older than Thomas. Was she another sister? Isaiah's biography noted, "His grandfather emigrated to this county from Virginia in 1805, when his father [Jacob Geiger] was six weeks old, and first settled in Licking township." Did Thomas travel to Licking Township with his sister and brother-in-law in 1805? That theory would fit with my working timeline. Good use of the information available to you. Love the timeline. Good luck on doing the hard work without the tracking device. Sounds like you're on the right track (no pun intended). Good luck! I sure hope so! Thanks for the well wishes, Amy.